I wrote this post last week and it will be shared on Intentionally Yours, but I just really felt like sharing it here as well. Once again while driving in to work I found myself face to face with God. It's easy, when you've been a Christian for a while to miss those moments. Moments where you can literally feel God's presence all around you, and it is as if He's sitting right next to you. There is no awkwardness in the silence. God's voice isn't usually audible for me, and sometimes the silence makes me uneasy. But not when God is concerned. There is so much peace in that silence. When you are overwhelmed with merely His presence, you don't need words. You don't need sound. Because it isn't what you hear in those moments. It's what happens in your heart. And I heard a song that morning that stripped away the distractions, the pain, and my own selfish desires. It wasn't so much the song, though the lyrics are the avenue with which God met me on my drive to work. I was enjoying the song, like any other day, listening and trying to focus on the lyrics. I try to have a very prayerful posture, inwardly anyway (because that literal posture would not be exactly safe while driving!) as I listen to music. Because these are the moments that God speaks softly to me, wooing my stubborn heart back to His, calling me to remember what He did for me. I have experienced this enough times to know exactly what was happening. Because it doesn't occur every single time I listen to music or pray, I really try to savor these moments with God, these glimpses of what Heaven will be like. And more and more, I find myself thinking about going home. Longing for the day when there is no more pain, of course. But more than that, my excitement to meet Jesus face to face seems to grow stronger each day. To fall at His feet and weep for joy, to be filled with so much wonder and pleasure I won't be able to contain it? What a day that will be! The song that sent my mind heavenward was Cornerstone, by Hillsong. It's a familiar song, in that it combines the lyrics of an old hymn with modern music and lyrics. And I'm a sucker for a good hymn. Many people underestimate the power in the lyrics of the hymns. I knew from the second line I'd wind up in tears. I could feel it. Because something happens to me when God arrives. True, He is ALWAYS there. But there are times, for me, that my heart siezes up-in a good way. I feel it clench almost, a literal gentle squeezing that send shivers down my spine and across my skin. And I have learned to welcome and embrace that! And I long for it when I am not experiencing it. What this song said to me reinforced the way I have been thinking of late. That true faith, true trust in God requires that we no longer care about what WE want. It's not about saying we trust God. It's not about believing that He will give us what we want-which isn't bad in and of itself. It's about really believing, with all that is in us, that no matter the outcome, we want what God wants. Even if it is pain. Even if it is enduring hardship after hardship. We step out in blind faith and walk with Jesus, knowing that we may get hurt, or continue to be hurt. Because the pain is inconsequential in light of God's strength to help us bear it. It isn't easy. Nothing that offers lasting reward and fulfillment is easy. You have to go through the pain and the effort to see the rewards. Otherwise you cannot truly appreciate the blessings in your life. This song says that Jesus is enough! Will you dare to trust that when it feels like your world is falling apart? Will you accept His road, though you cannot see the bumps (and sometimes sinkholes) that await? Though you may not have a physical spouse or friend to walk beside you, will you believe that Christ is ALL you need? For the rest of your life? 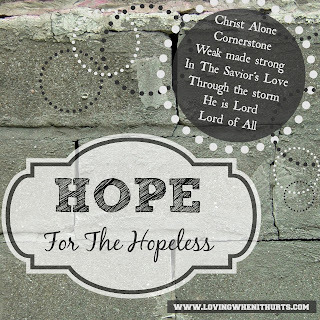 Without Christ, there is no hope. 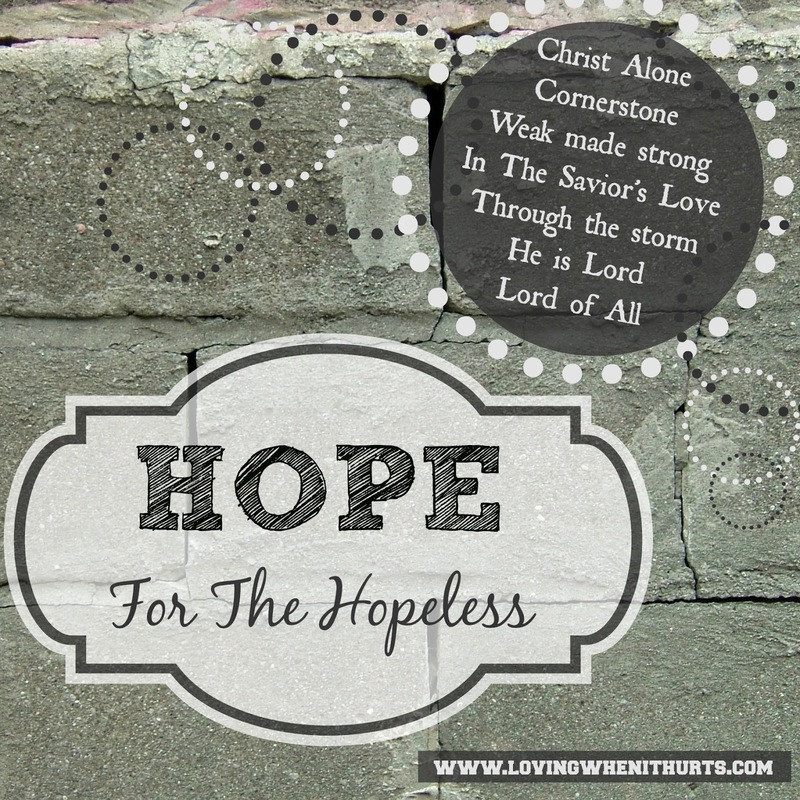 If you feel hopeless, or like nothing is going right--like you will always be alone--you have to choose to believe that God is who He says He is, and that Jesus is enough to fill the loneliness, to give you the hope to get through moment by moment. Without that kind of faith in God, you will not feel hope. And without hope, you will wither away and fall into the hands of the enemy. I hope that you will allow this song and the truth in it to wash over you today, to cleanse your heart of holding onto the hurt that threatens to destroy you. My prayer is that you be filled with an undeniable peace that comes only from truly putting your hope in Christ. Christ alone is the Cornerstone. "True trust in God requires that we no longer care about what WE want." This resonates with me today as I struggle with another job loss. After only six weeks with a new company they eliminated my position. I remain in a place of gratitude for that income which enabled me to pay a large tax bill and send my children to Christian camp this summer. I just have to trust that He's got my back! So sorry for your job loss. I was 34 before I experienced this for the first time and it was one of the worst experiences! So glad that you are able to recognize the blessing in the pain. Some days it is really hard to see beyond the circumstances of this temporary life. Those are my favorite moments with God. It's those moments, when a song comes on and I feel God saying 'Listen up!' And so I listen. And I can feel my heart opening more and more...and then the next song comes on...and somehow it's all in sync with what is going on in my mind and...it's just such an awesome experience! Thank you for sharing this post at The Weekend Brew. My husband and I have walked through a hard season, four years of unemployment which, although employed now, left a huge hole in our hearts and financial debt. We had to say goodbye to so many things. We strive to see His blessings all around, because even though He takes away, blessed by the Name of the Lord.